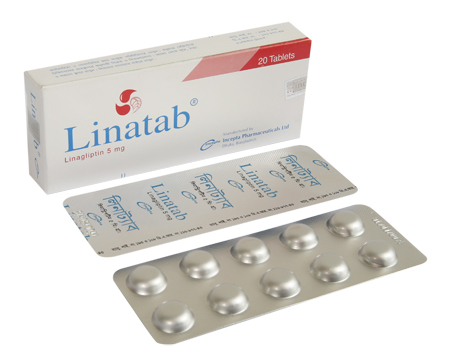 Linatab : Each tablet contains Linagliptin INN 5 mg.
Linagliptin is a dipeptidyl peptidase-4 (DPP-4) inhibitor, which exerts its action by slowing the inactivation of incretin hormones. Incretin hormones, including glucagon-like peptide-1(GLP-1) and glucose-dependent Insulinotropic polypeptide (GIP), are released by the intestine throughout the day and levels are increased in response to a meal. These hormones are rapidly inactivated by the enzyme, DPP-4. The incretins are part of an endogenous system involved in the physiologic regulation of glucose homeostasis. When blood glucose concentrations are normal or elevated, GLP-1 and GIP increase Insulin synthesis and release from pancreatic beta cells by intracellular signaling pathways involving cyclic AMP. GLP-1 also lowers glucagon secretion from pancreatic alpha cells, leading to reduced hepatic glucose production. ● in patients inadequately controlled by diet and exercise alone and for whom Metformin is inappropriate due to intolerance, or contraindicated due to renal impairment. ● in combination with Metformin when diet and exercise plus Metformin alone do not provide adequate glycaemic control. ● in combination with a Sulphonylurea and Metformin when diet and exercise plus dual therapy with these medicinal products do not provide adequate glycaemic control. ● in combination with Insulin with or without Metformin, when this regimen alone, with diet and exercise, does not provide adequate glycaemic control. ● The recommended dose of Linagliptin is 5 mg once daily. ● Linagliptin can be taken with or without food at any time of the day. If a dose is missed, it should be taken as soon as the patient remembers. A double dose should not be taken on the same day. ● When Linagliptin is added to Metformin, the dose of Metformin should be maintained, and Linagliptin administered concomitantly. ● When Linagliptin is used in combination with a Sulphonylurea or with Insulin, a lower dose of the Sulphonylurea or Insulin, may be considered to reduce the risk of hypoglycaemia. The most common side effects of Linagliptin are stuffy or runny nose and sore throat. Hypoglycemia may occur when Linagliptin is combined with Insulin or Sulfonylurea and Metformin. Allergic reaction and musle pain also may occur. Pancreatitis, angioedema (frequency rare) and urticaria (frequency rare) were identified as additional adverse reactions. Linagliptin should not be used in patients with type-1 diabetes or for the treatment of diabetic ketoacidosis. Caution is advised when Linagliptin is used in combination with a Sulphonylurea and/or Insulin. A dose reduction of the Sulphonylurea or Insulin, may be considered. In post-marketing experience of Linagliptin there have been spontaneously reported adverse reactions of acute pancreatitis. Patients should be informed of the characteristic symptom of acute pancreatitis: persistent, severe abdominal pain. Resolution of pancreatitis has been observed after discontinuation of Linagliptin. If pancreatitis is suspected, Linagliptin should be discontinued. The use of Linagliptin has not been studied in pregnant women. Animal studies do not indicate direct or indirect harmful effects with respect to reproductive toxicity. As a precautionary measure, it is preferable to avoid the use of Linagliptin during pregnancy. Available pharmacokinetic data in animals have shown excretion of Linagliptin/metabolites in milk. A risk to the breast-feed child cannot be excluded. A decision must be made whether to discontinue breast-feeding or to discontinue/abstain from Linagliptin therapy taking into account the benefit of breast-feeding for the child and the benefit of therapy for the woman. The safety and efficacy of Linagliptin in children and adolescents has not yet been established. No data are available. However, clinical experience in patients > 80 years of age is limited and caution should be exercised when treating this population.